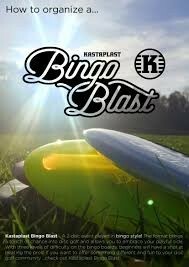 The only discs allowed on Kastaplast Bingo Blast are the two discs from the player package. will find what you need to score, at worst, on that hole to clear that box. Circle it. es cleared, before handing it in to the TD (you will get it back afterwards). higher, clear that box only. rows. This box should also be counted when you summarize your round in ‘Boxes cleared’. and whether it’s a Golden Hole or not, an ace will give 2-6 bingos. ever, it will be most fun if you find the board challenging. the sign. Only your first throw from tee is valid for KTP. The hole is then played as any other hole. signs. There will also be a raffle for further prizes. Casey Lee is responsible for all refunds/cancelations.